Gluten-Free Living (GFL) magazine and the Celiac Disease Foundation (CDF) have a shared vision: to promote the advancement of celiac disease research and spotlight celiac and gluten-free champions in our community. 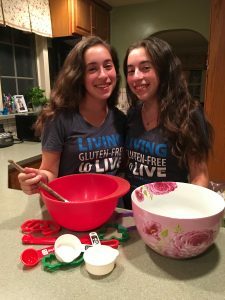 With this vision in mind, GFL is proud to introduce passionate and dedicated CDF Student Ambassadors from across the U.S. Below, meet twins Rayna and Hallie Katzman, who formed the Food Sensitivities Awareness Club at their high school and are publishing a book about being diagnosed with celiac. Short Hills, New Jersey, living with and raising awareness about celiac. We became CDF Student Ambassadors shortly after we created the Food Sensitivities Awareness (FSA) Club in 9th grade with two friends, one of whom also has celiac. The club’s mission has been to spread awareness about food allergies and sensitivities, including celiac disease, nut allergies and lactose intolerance. We became Student Ambassadors to learn more about our disease and to have the tools to educate others. We invited a local nutritionist to attend a meeting of the FSA Club, where we discussed an informative video provided by the Celiac Disease Foundation. We reviewed how to read nutrition labels and make informed decisions about foods that are “safe” to eat. Over the past few years, we have held allergy-free bake sales, donated allergy-friendly foods to a local food bank and helped raise fund toward research to find cures for food-related diseases. On our FSA Facebook page, we have highlighted Celiac Disease Awareness Month and posted allergen-friendly baking videos. We have participated in the Teal Pumpkin Project and the local Food Allergy Research and Education (FARE) walk to support others with food-related sensitivities, including but not limited to gluten and wheat. Finally, we are in the process of publishing a book titled Everyone’s Got Something: My First Year with Celiac Disease, which we expect to be out this fall. Written in journal-entry form, it is a fictional book based on the real-life first-year experiences of a 13-year-old diagnosed with celiac disease, how she copes and comes to realize that she can do this! A portion of the proceeds of every book purchased will be donated to the Celiac Disease Foundation. We are really excited! When we are not working in our roles as Student Ambassadors, you can find us on the tennis court—this year we are co-captains of our varsity tennis team! Check out other Celiac Kids in Motion and our Kids’ section to find everything from fun recipes to practical tips and advice for children, adolescents and teens!